You need a Burning Permit to burn leaves, brush or grass outside incorporated cities and villages when the ground is not completely snow covered during the months of January through May. Burning Permits are required to burn in a barrel or incinerator, in a pit or on the ground. No burning is allowed until after 6:00 p.m. unless your burning permit states otherwise. 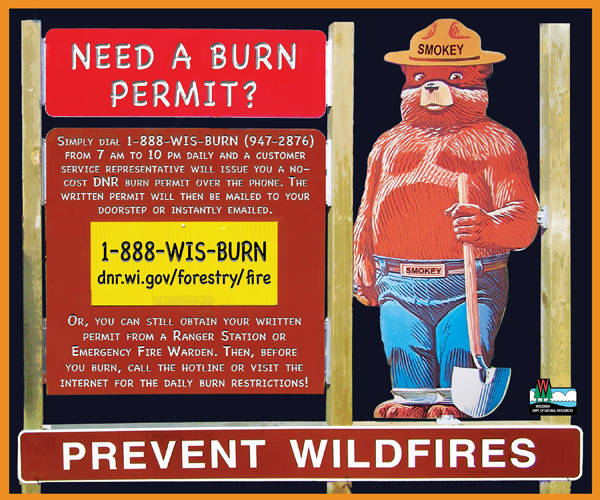 Burning Permits are free. You may be issued a citation for burning without the proper permit. Failure to completely extinguish your fire before leaving can be a crime, resulting in a fine and / or jail time. Your fire is YOUR responsibility!